This adventure took us a good part of the day, namely because the Alkali Ridge Historical Landmark is difficult to find. Oh, it's listed on maps, but good luck getting specific directions to the site, and there are no signs indicating its location. These were the directions that one online site (Visiting the Ancients) gave to find the ruins, "Access is via a well traveled gravel road suitable for lower clearance two-wheel drive cars (watch out for oil field trucks) and several 4-wheel drive stem roads accessible with high clearance four-wheel drive vehicles. The 4-wheel drive roads on Alkali Ridge also offer some decent mountain bike rides (another way to get from site to site). For the driver, you need only to park any place on the mesa, walk into the trees, or out into one of the clear areas, and start looking around." There are obvious problems with these directions: #1 - Which gravel road is being referred to, Alkali Point Road (CR 204) or Mustang Road (CR 207)? The historical landmark is located within a canyon between these two roads; from Alkali Point the cliff dwellings can be viewed from across the canyon. #2 - To get to the mesa top ruins, the instructions state to "park any place"...really? Could the writer of "Visiting the Ancients" be a little more specific at all? What we have figured out is that the mesa top ruins are both sides of both roads (Alkali Point walking westward, Mustang Road walking eastward), and we believe we have an estimate of where to park to find them. #3 - While the two main roads are graded gravel and cars would make it over them; the access roads down into the canyon are 4-wheel drive friendly only. Also, many of the dirt roads end at fenced in private property which you don't discover until you've traveled down them. Best to get started at the beginning which is at the junction of Mustang and Alkali Point Roads; by the way, the Alkali is only about 14 miles in total distance before reaching Perkins Road (CR 206). The road itself is mainly graded gravel, some areas flat with sage brush or dense with trees; those times when a section opens up between the trees is when you get to see the amazing surprises in the distance. The first two miles traveling south we explored several dirt trails leading to the west; only to be disappointed by a wooden and wire fence with no trespassing and private property signs posted. At mile 2.2 we went off on a trail that lead eastward and ended up at a beautiful primitive area with signs of it being a camping area as well. Climbing over the huge rock formation at the end was sheer fun, as well as examining the way the elements carved out the stone itself. No sight of any ruins though, so the search continued to the 3.3 mile point where the road split and we went down the trail leading west once again. While it started out as graded dirt for the first two miles, it soon changed to an unmaintained rough road not suitable for cars, but fine for 4 wheel drive vehicles. There is a sort of "traffic circle" with the second trail leading to oil tanks and equipment; the first trail, however, went on for three miles before leading off down to the right hand side. Only a couple of miles down we stopped to check out one series of rock formations that looked so awesome. At the far upper right hand corner, it looks as if a pig is kissing a crocodile; or is the pig about to become the croc's dinner? Anyway, it was at eight miles down that we began seeing the cliff dwellings along the Alkali Ridge walls; the only way to walk to them was to park and do a bit of hiking. We thought about driving through the dried river beds, but were concerned about getting stuck in the deep sand. I've included a few photos of just the walls themselves, so you can see how easily it is to miss the ruins with all the cracks, crevices and caves. Welcome to the Alkali Ridge Historical Landmark, placed on the National Register in 1964, which are fine examples of the earliest forms of Puebloan architecture (c. 900 CE – c. 1100 CE). Pottery found in this area was sent to the University of Pennsylvania; cacao residue within proved that the ancestral people of that era were using chocolate even before the Aztec of Mexico. The "cacao pottery" was not of the typical "black design on white base", but rather "black design on red", or better known as "Deadman Black on Red"; the sandstone coming from Deadman Canyon. The pottery is currently included in "Chocolate - The Exhibition" at the Natural History Museum of Utah, located in Salt Lake City, Utah. Most likely, indication signs are missing due to the locals not wishing the area to be visited by "outsiders", but this exhibit is drawing attention and the curious will be coming. This road is also the home of petroleum and gas extraction; it ends at the 8.5 mile mark at a beautifully primitive area which has been clearly used for camping. Backtracking to Alkali Point Road, we headed on south towards Perkins Road which would take us either to Blanding, or towards Montezuma Canyon Road (CR 146). At mile 4.1, the east side of the wooded area opened up to this amazing vista; a glance at the map indicated this was Devil Mesa. I noticed a large straight structure sticking upwards on the side of the mesa, so pulling out the zoom lens...well what do you know, I found the devil himself residing right here in San Juan County. The structure is a pinnacle which has a "potbellied" middle and a very discernible head atop a neck, with horns pertruding out of the "skull". At mile 5.3 is the unmarked Bradford Canyon Road (CR 202) which I've already told you is an ATVer's paradise road. As we got closer to Perkins Road though, another section of wooded area opened up to the west; we got an amazing view of the Alkali Ridge with the Bears Ears in the far distance. I will never ever get enough of our blue sky! ...and while this should have been named "All Roads Lead to Montezuma Canyon - Alkali Point Road" because that is where we ended up heading to, I wanted to draw your attention to the Alkali Ridge Historical Landmark. So, find the ruins and then head on up to Salt Lake City to see the pottery exhibit, or vice versa; either way you will have a most awesome adventure. WANTED! Visitors, Tourists, Golfers, Adventurers to Monticello, Utah. Spring is here and the weather is prime for visiting Southeastern Utah! Not sure where to go and stay or what to see and do; here's a hint...begin your adventure in Monticello, Utah. This "little city" may have that small hometown look and feel, but it is the focal point of grand and great adventures. Being the crossroads of Route 191 and Route 491 makes it the epicenter for reaching the Four Corners of Utah, Arizona, Colorado and New Mexico. First building you need to make your way to is the Monticello Frontier Museum/Welcome Center which is quickly becoming the premier information center of San Juan County; clean restrooms; free informational brochures, booklets, local phone books and maps; an assortment of books, maps, postcards, puzzles, toys, apparel for sale; a diorama of Monticello spanning 1888 to 1911; the museum allowing the viewer to see a history of San Juan County's pioneers and Native American cultures; fine examples of horse drawn farm implements adorn the outside of the building. 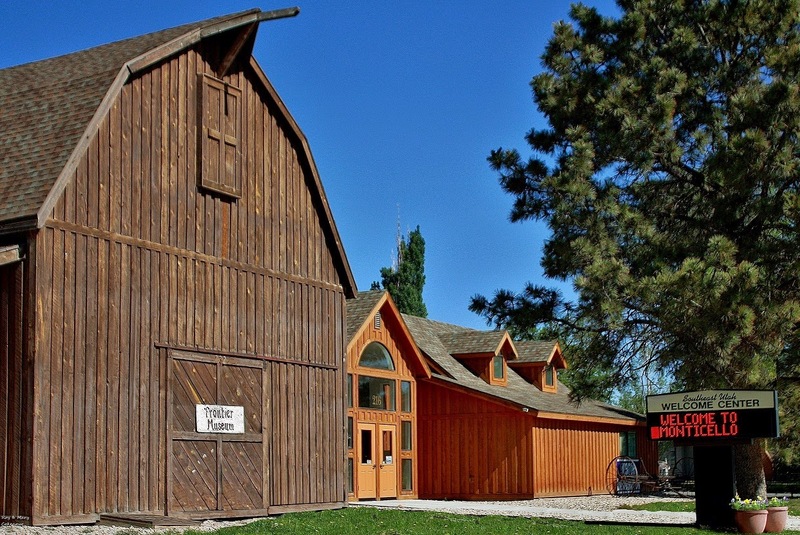 The newest edition is the "Big 4 Tractor" museum which houses the famous tractor, and will include photos and implements associated with tractors. The "Community Ambassadors" who staff the Center live locally, so are a great resource when it comes to planning out your stay. Their philosophy is, "We don't just give you vacation ideas, we send you on an Adventure! "; whether planning out a day trip, or several days, they can map out travel loops to maximize your total experience. Need gas, snacks, cold drinks; there are three gasoline/convenience stores within the town: Shell, Maverik and Conoco. The Conoco station encompasses a Subway and also offers hot, freshly made pizza. The Shell station encompasses a Taco Time and Chesters Fried Chicken ; while Maverik offers its own line of hot food products. Hold on now, what about a freshly made boxed lunch to take out on that hiking, driving or climbing adventure; the Peacetree Cafe offers smoothies, wraps, salads and sandwiches while PJ's Cafe does the more traditional hot sandwiches, burgers and fries. Looking for a sit down place, again the Peacetree and PJ's offers breakfast, lunch and dinner menus, but if you're looking for comfort food that makes you go "Ahhhh" and makes you feel warm all over, then head on over to the R & F Restaurant, (435) 587-2400. K & A Chuckwagon will be reopening soon (June 2014) to offer its authentic chuckwagon style dinners. Looking for a steakhouse (serving dinner only, beginning at 5pm), Line Camp Steakhouse, (435) 587-2351 (9 miles north on Peters Hill), is your go-to place and offers seafood dishes also. Line Camp is also the location for the Runnin' Iron Inn and offers sites for RVs and camping. What kind of stores can offer amenities to travelers? Blue Mountain Foods is the local market and while the selection may be limited, they do have the best bakery in the area. If you have special dietary needs or are looking for a much larger selection in variety, then City Market in Moab, Utah or Cortez, Colorado (a Walmart also) is your best bet. Before going, make sure to plan out your trip to Kane Creek Overlook, Flat Pass/Steel Bender, Canyonlands National Park (all in San Juan County) if heading to Moab. Colorado way, get details on the Hovenweep National Monument and Lowry Pueblo Ruins loop; visit the Anasazi Heritage Museum; or make the pilgrimage to Mesa Verde. San Juan Pharmacy offers all types of health and beauty aids, plus a selection of gifts and souvenirs; while you're there, say hello to the pharmacist, and Mayor of Monticello, Tim Young. The Merchantile has household items, and sells fabrics for all you quilters that cannot resist buying up new fat squares or yards; a Family Dollar just had their grand opening on Center Street; Napa Auto is on Main Street for your automotive needs. Looking for Native American crafts or unusual gifts, try out the Abajo Trading Post or the new Monticello Artisan Co-Op. Are you in need of auto repair, oil change, or just want to make sure your vehicle is in good shape? Call Steve at Draper's Towing and Repair, (435) 587-2788; if he isn't able to help you out, he won't hesitate to direct you to another auto service in the town that can. Needing cash fast? Wells Fargo and Zions Bank have ATMs; while you might not want to travel with a lot of cash, most businesses take Visa and Mastercard (American Express and Discover not so much). Monticello has an assortment of hotels, motels, a bed and breakfast (Grist Mill Inn), National Forest campgrounds, RV parks and campsites. To find the best place suited to your desires, check out reviews on TripAdvisor.com or Yelp.com; what better way than to hear what fellow travelers have to recommend? Still not sure, once again, call or go to the best source in town, the Welcome Center! Did you know that, besides the typical cattle ranches, Monticello has an alpaca ranch? 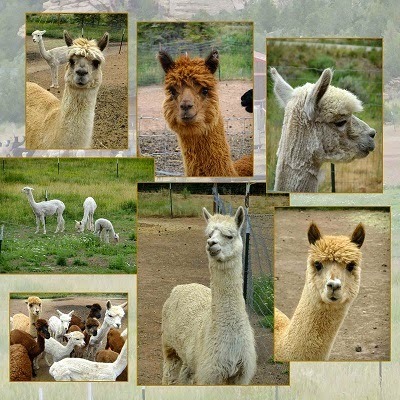 The Peter Springs Alpaca Ranch, Dorothy Pipkin-Padilla (Owner), Phone: (435) 419-0750, Email: dpalpaca9@yahoo.com Alpaca items are for sale, especially the "pooh" for all you gardeners; tour group coordinators, call Dorothy and see about arranging a tour of the ranch. Golfers, are you looking for a paradise full of green lawn and holes-in-one; the Hideout Golf Course is your siren's song. Lastly, looking to buy or rent a home here in Monticello; contact Robert Hatch at Lex Realty, (435) 587-1044, Email: roberthatch@frontiernet.net to help find that perfect location for your needs. Remember, a stay in Southeastern Utah begins in Monticello, Utah...who knows, you might love it so much, you'll be buying a home through Lex Realty. In our attempts to explore the canyons between Monticello and Blanding, we often need to go back to a particular road to be able to finish it. Such is the case with Mustang Road (CR 207) and if you click Here, it will bring you to the map of that road (highlighted in purple). The day we did this we also intended on finishing up Alkali Point Road (CR 204) and find the ruins along it. Driving down to Blanding, we picked up a bagged lunch at the A&W again and began our adventure along Perkins Road (CR 206). Mustang Road is only 8.8 miles from Main Street in Blanding; one mile east is Mustang Wells Road (CR 286), but it is closed off to the public. Oh, while we were on CR 206, we drove past the Elk ranch and happened upon two bull Elks sparring with their antlers. Their coats were beginning the shed of winter; spring fever called for a show of dominance. Driving along Mustang Road, the landscape is flat and full of sage brush; most probably why Mustang Flat is named as such. Looking up the road is the same as looking back at where you came from...flat and sparse, but a great view of the Abajo Mountains. About 3.6 miles north there's a curve in the road and a large wooden gate with the name "Wimachtendienk" on it. The only information I could find on the name was that it is from the Lenape language and means "brotherhood". This word is associated with a group that is part of the Boys Scouts of America, "Order of the Arrow"; founded 1915 by S. Umer Goodman and Carroll A. Edson. The troops which follow this path maintain Native American traditions and ceremonies. This road parallels Mustang Flat and most of it is closed off due to being privately owned. 11.3 miles north we found an abandoned homestead; personally I enjoy photographing these types of buildings as they tell a definite story behind the settling of the southwest.